Situated on a valuable 9-acre tract in densely developed Paramus, the threatened Van Dien-Ruffgarten house has for many years been mostly known to locals with the inaccurate label, the “Mud House”. 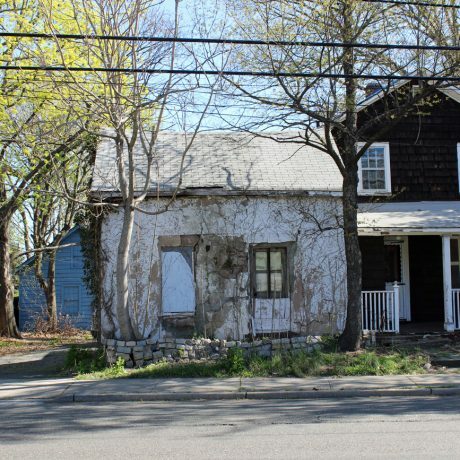 In reality, this c. 1840s house is one of six remaining examples in the Borough of Paramus of a Jersey Dutch Stone house, an increasingly rare type of construction in New Jersey. Jersey Dutch Stone Houses were constructed all or partially from stone, a popular building method used by early Dutch settlers. The Van Dien-Ruffgarten House was mislabeled as the “Mud House” by a local historian surveying Paramus’ historic buildings in the 1960s, who was not familiar with the typical Dutch Stone construction method of laying stones in mud mortar. The result of this labeling error is that this example of a Jersey Dutch Stone house has not been known and appreciated by the public and Borough officials. Constructed by a member of the well-off Van Dien family around the 1840s, the house was likely one of the last stone houses built by the Jersey Dutch. Census records strongly suggest that this modest house was occupied during the 1850s and l860s by African American families who were part of a small enclave of independent, educated African Americans who were living in this community at the time. In 1869, the house was sold to Peter Ruffgarten, a recent immigrant from the Netherlands, who enlarged the home by adding a frame section. For several years in the recent past, the house was operated as a boarding house and currently is unoccupied and in a badly deteriorated condition. When the home was for sale recently, the local Paramus Historic Preservation Commission requested that the Borough administration consider purchasing this significant building to preserve it. The Borough was not interested in obtaining the property. It is currently for sale with an advertisement of the property as available for builders’ lots. A lot of this size, over nine acres, is a valuable piece of property in this densely developed municipality; in fact, a smaller lot across the street sold recently and has been redeveloped with twenty townhouses. There is tremendous development pressure mitigating against this little vernacular Jersey Dutch Stone house that was hidden behind the “Mud House” label for much of the last 50 years.